Today, I'll show you how to delete, move, and copy branches from one place to another in your tree using @> in combination with other LTREE functions. 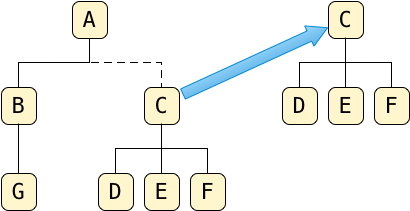 Previously, I used the LTREE extension to save a tree data structure in a Postgres table. After saving the tree, I used the @>, or ancestor operator, to count the number of descendant nodes on a given branch. But that's not all LTREE can do. Today, I'll show you how to delete, move, and copy branches from one place to another in your tree using @> in combination with other LTREE functions. After that, in my last post in this series, I'll look at how LTREE works under the hood and explore the computer science that makes all of this possible. As you can see, I can use @> equally well in delete statements as in select statements. I could write a separate update statement for each node — just four SQL statements for my example. But imagine I had hundreds or thousands of nodes in my tree. Updating the records one SQL statement at a time would require repeated network connections from my application to Postgres, slowing down the overall operation tremendously. Instead, I need to update the path of C and each of its descendants all in a single operation. But how can I do this? Two LTREE functions, NLEVEL() and SUBPATH(), can help. Looking at this, it's easy to understand what the function returns: For a root node like A, NLEVEL returns 1. For A's child nodes, A.B and A.C, NLEVEL returns 2. For the grandchild nodes, it returns 3. It simply counts the number of levels in each path string; internally, it parses the path string for period characters. Before we continue, consider one subtle but important point. Notice that I was able to calculate NLEVEL on all of the records in the tree table with a single SQL statement! Postgres applied the function to all of the matching paths for me. The power of LTREE's functions is that they seamlessly integrate with SQL, harnessing and extending the power of Postgres. Oops — I've done something wrong here. Calling subpath(path, 1) returns the portion of the path starting with offset 1. Not a character offset, but a path offset. So subpath(path, 1) drops the first level of the path, A in my tree, and returns the remaining portion of each path starting from the second path element. Internally, LTREE parses the periods for me, drops the requested number of path levels, and removes the extra leading period. In the statement above, the error was caused by the root node in the tree: A. This path has only one level, and so LTREE returns an error in this case. Now, I get only four records in the result: one for C and one for each node that appears under C. And you can see that the subpath column contains the portion of the path that appears after A, for each of these four records. And again, notice that I was able to execute the SUBPATH function on all four tree records that I wanted to — in a single operation. This time, the SUBPATH function worked in concert with the <@ operator. 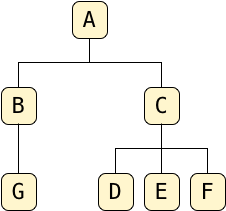 LTREE has made the SQL language I already know how to use even more powerful. I use where path <@ 'A.C' to scope the update to the C branch and I use subpath(path, 1) to remove the A root element from the path of C and each of its descendants. …assuming nlevel(BRANCH_PATH) > 1, that is assuming the branch we want to replant isn’t already a root. 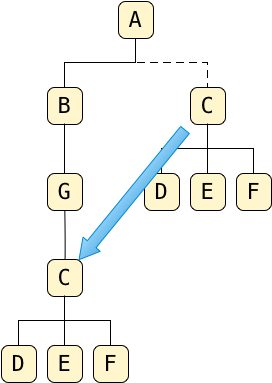 You can see LTREE has automatically added A.B.G, along with a period separator to each path in my table. And it has done this for all the paths in my table in a single operation. I get the same results as above, but now only for the tree nodes that I want to move. …I have the single SQL statement I need! One last puzzle: How can I copy a tree branch instead of moving it? I just use an insert SQL statement instead of update. Simple, right? Executing this, Postgres will first find all the nodes inside the branch I want to copy and recalculate their paths. Then, it will insert that result set into the tree as a copy, leaving my original branch unchanged! By writing this tree-related logic using LTREE operators in SQL, I ask Postgres to do all of the hard work of manipulating and copying the path strings for me. I don’t have to write application code to keep track of these strings, and no data needs to be transmitted back and forth between my application server and the database server. In my last post about LTREE, I’ll look closely at how it works internally. It’s easy enough to imagine how simple functions like NLEVEL, ||, or SUBPATH work. That’s not the interesting part for me. These functions are shorthand for fairly simple string operations. The special sauce that makes LTREE such a powerful tool is that it integrates with Postgres GiST indexes. By using an index, Postgres can execute any of the SQL expressions I wrote above equally fast on 7,000 records as it would on 7! How? The only way to find out is by looking inside Postgres at a GiST index.